Dona Flora salves offer a blend of herbal nutrients traditionally used to stimulate the healing of injuries and rashes. Our salves, in a base of olive and safflower oils, contain organic or wild crafted herbs harvested from our fields which work together to nourish your skin and protect and repair chapped, dry or cracked skin. Like any gardener I have always had trouble with dry and cracking hands, so, I developed a salve especially for gardeners ­­– or anyone who needs a deep penetrating moisturizer. Gardener’s Salve contains herbal oil, made with cal-endula, comfrey, chickweed, Echinacea and other herbs. We add lanolin and beeswax, vitamin E oil, and essential oils. I hope you’ll find as much relief from our Gardener’s Salve as I do. Lavender scented with aloe vera added for an extra soothing salve, Skagit Salve is a local favorite for moisturizing and repairing dry, chapped skin. Calendula flowers, olive and safflower oils are combined with lanolin, aloe vera, and vitamin E oil to make this simple but effective salve. Our brand new salve for babies is formulated from organic extra virgin olive oil and our own calendula, plantain and comfrey. Vitamin E oil, organic essential oil of lemon with local beeswax completes this gentle formula. Moisturizing, repairing, and protecting tender baby skin. A warming rub with ginger, turmeric and other warming herbs for soothing aching muscles and joints. Our lip balm is made with herbed olive oil, lanolin, beeswax and essential oil for a protective, aromatic and soothing feel. We offer mint, citrus rose or lavender. A strong warning for sore muscles and joints, spasms or cold feet, Dona Flora liniment is one of our best sellers featuring camphor, wintergreen, cayenne, mustard, St. John’s wort and other herbs traditionally used for reducing inflammation and relieving pain. Formulated with arrowroot powder, herbs and a touch of essential oil, our bath and body powders are soothing and aromatic. Our skin softening, refreshing bath elixirs make excellent gifts any time of year. A nutritive cream scented with attar of roses and packed with wonderful ingredients for rejuvenating and moisturizing the skin such as avocado oil, rosehip seed oil, calendula oil, St. John’s wort oil, aloe vera oil, tincture of fresh roses and more. Face cream features herbed olive, avocado, rosehip seed, aloe vera oils, cocoa and shea butter, fresh calendula tincture and other ingredients and is great for moisturizing and repairing the face as well as the body. Contains many of the same ingredients as the Lavender Face Cream with a touch of witch hazel tincture for added astringency. Our foot cream is full of herbs traditionally known for their anti-fungal properties such as thyme, chaparral, sage, wormwood & cedar. Lavender scented with a hit of ginger, pine and peppermint, our foot massage cream is blended in a base of walnut and olive oil and has a smooth texture that leaves your feet feeling fresh and invigorated. 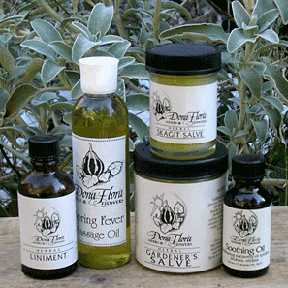 ​Our massage oils are a combination of soothing herbs in a base of olive and walnut oil. Our fragrant blends are made with carefully selected, pure essential oils. The ideal companion to a first aid cupboard, Soothing Oil contains arnica, calendula and St. John’s wort. These are traditional herbs for acute conditions such as strains, sprains, contusions, hyperextensions, and other muscle or skeletal traumas. Our new Belly Oil has calendula, comfrey, and plantain in an organic olive oil base. With vitamin E oil added, it makes a wonderful softening belly rub to help minimize stretch marks during pregnancy.